We plant a lot of peanuts on plantations here in Thomas County. 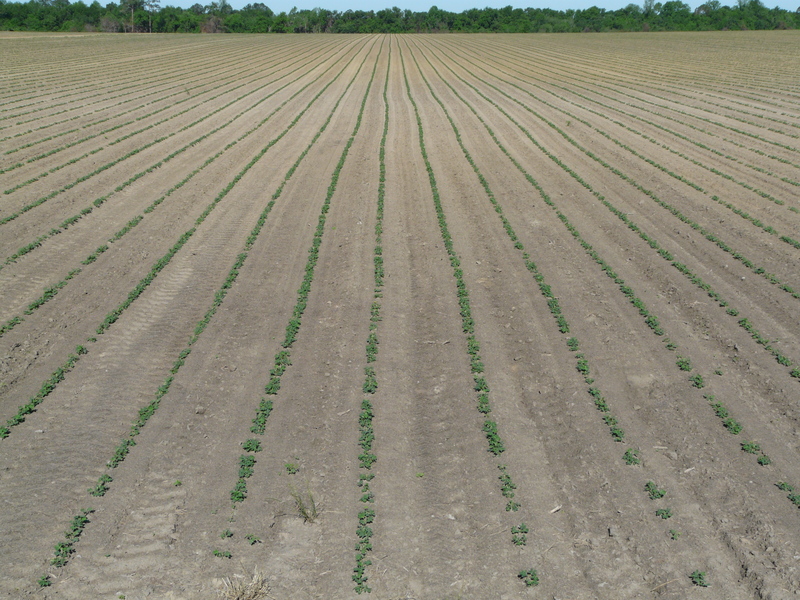 As we were finishing up peanut planting, manager at Wild Ridge Plantation Jason Sanders made a great video of them planting near the Florida line. They filmed it with a drone camera. Jason did a great job making this video. I think I need to get my ‘video band’ down to Wild Ridge and get a band shot from this drone camera. Peanuts that were planted approximately the last two weeks in May were in a great place to get hammered from Valor because of the Sporadic heavy rainfall events (below). If you received one of these heavy rainfall events on Valor treated peanuts when they are cracking and small (~2 weeks after cracking), injury will occur. Peanuts typically recover from this injury without a yield penalty. 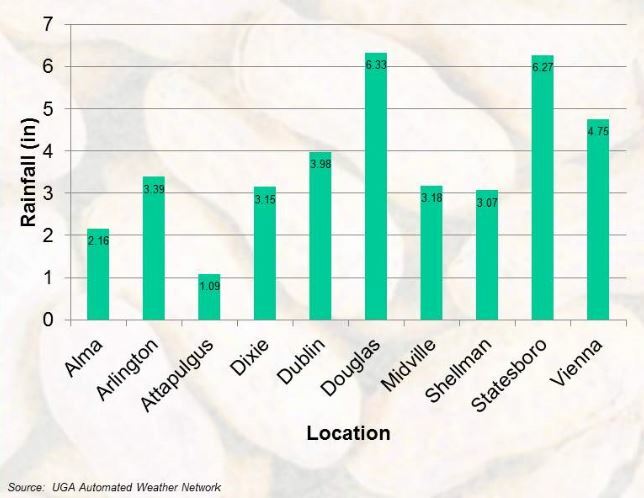 In a 2009 research trial, more than 5″ of rainfall occurred in the 30 day period after peanut planting. 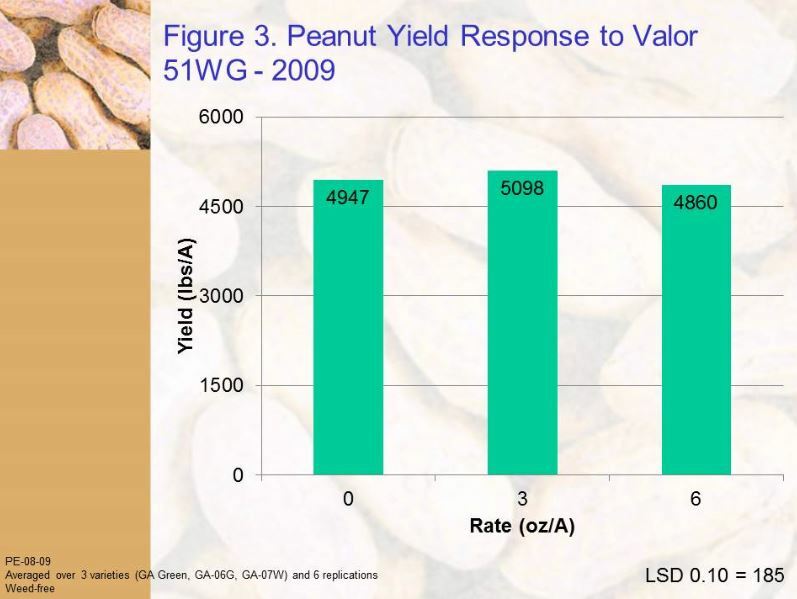 Peanut injury was significant but yields were not reduced even at a 2X rate. We looked at a new spot of cogongrass Monday which came just after burn. This is probably why the leaves appear lighter in color.UGA Extension Forester Dr. David Moorhead says this is typical cogongrass response to a spring burn. Two to three weeks following a burn is always a good time to look for cogongrass. If you look at other blog posts I have on cogongrass, you will see a difference in this color. We thought this was actually Johnsongrass. Once we walked into the patch, we found some off-center midribs and sharp rhizomes. Those are the two, key ID features you want to look for. 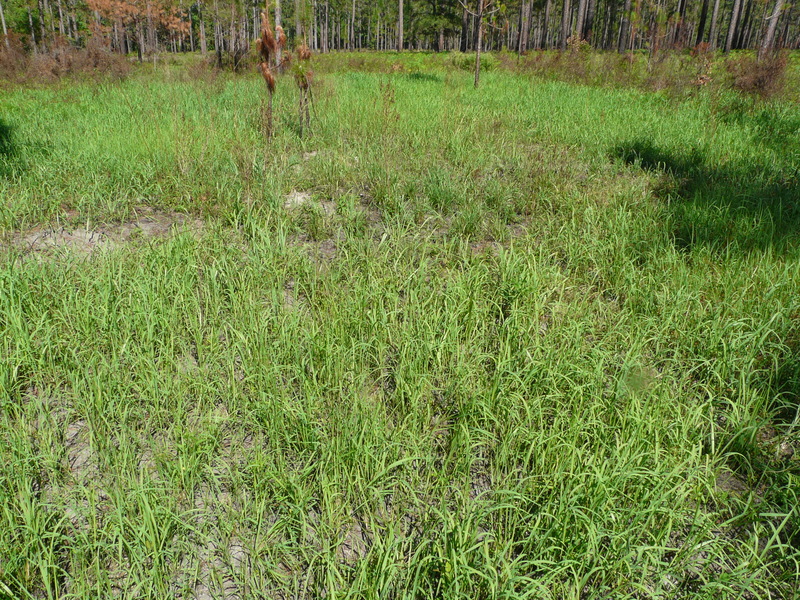 Cogongrass spreads by rhizomes, which is why you see it in this circular pattern. When you rub down the blade, you’ll feel a ‘rough’ texture, like shark skin. Quail definitely do not like to move through this grass. It’s extremely invasive and will wipe out an ecosystem in your forest. This is huge for us in Thomas County where so much timber is managed for wildlife as well. 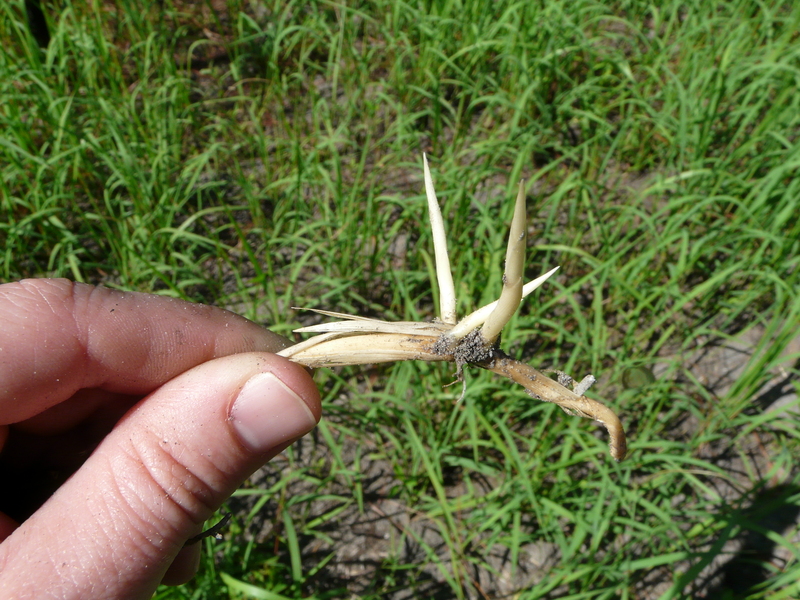 Sharp rhizomes are another key ID feature of cogongrass. A lot of times you can place your hand on the ground (softly) and feel the rhizomes poking up. We actually want to be cautious about burning cogongrass since it can burns around 850 degrees F. Georgia Forestry Commision Forest Health Specilist Mark McClure says most timber on our plantations are widely spaced and damage from burning cogongrass is not a high risk. Mark says this is actually a good time to burn cogongrass and is a good idea to burn it if we see it. This is because fresh growth of cogongrass helps when treated. We are very, very fortunate in Georgia to have help from the Georgia Forestry Commission on treating these spots at no charge. Mark McClure coordinates the Task Force of the Georgia Forestry Commission which treats reported cogongrass. 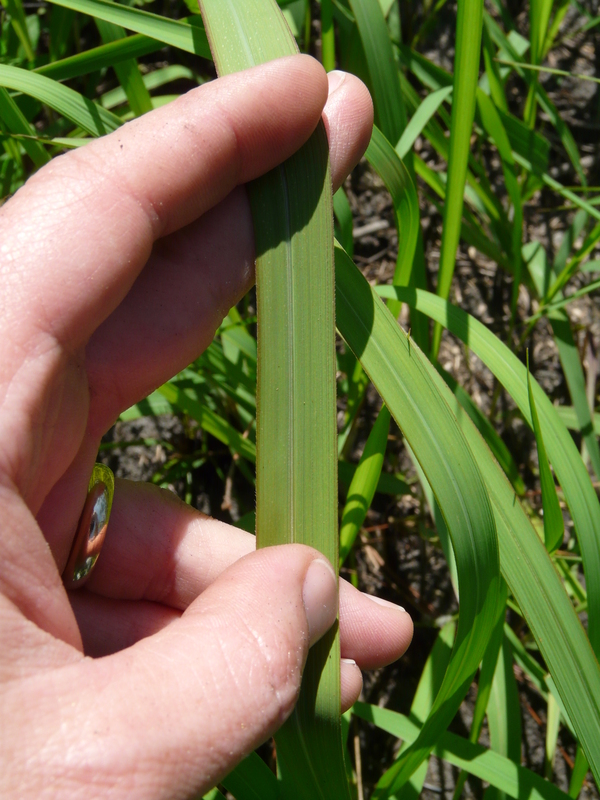 If you see what looks like cogongrass, call the Georgia Forestry Commission or the Thomas County Extension Office (225-4130) to get a positive ID so it can be treated. Some of our earlier planted corn is moving through the v8 growth stage. 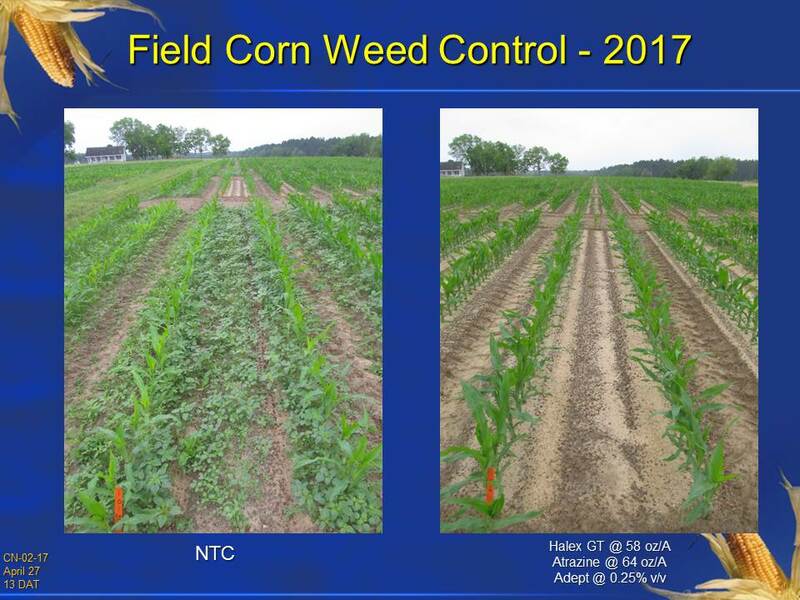 In this field corn, we are nearly past the time for over-the-top herbicide applications without yield loss. We’ve been applying mostly one shot Atrazine+RU+Prowl H2O when corn has about 3 leaves. It’s working great. We have a one or two fields were pigweed got past it and hurting us. 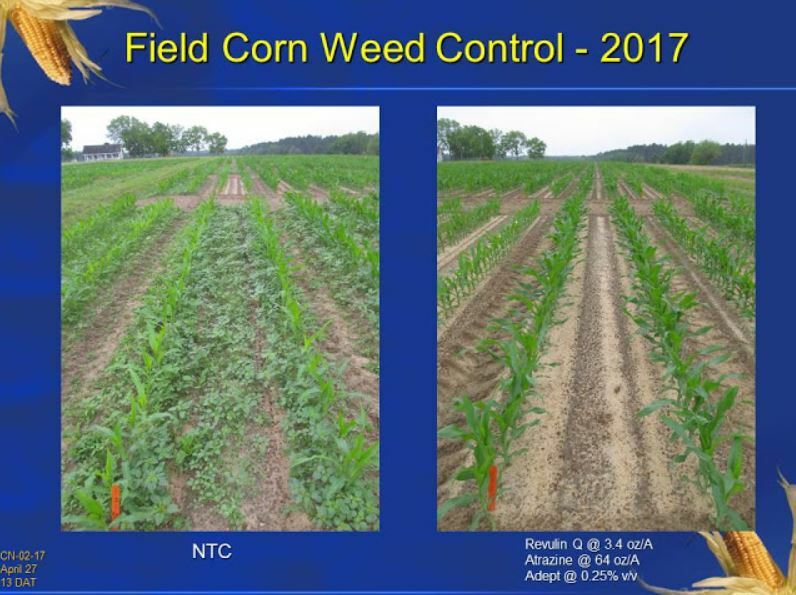 Field corn weed control does not have to be difficult. Just about any of the herbicide programs that growers are using in Georgia do a good job of controlling most weeds, especially Palmer amaranth, when applied to small plants (<3″ tall). 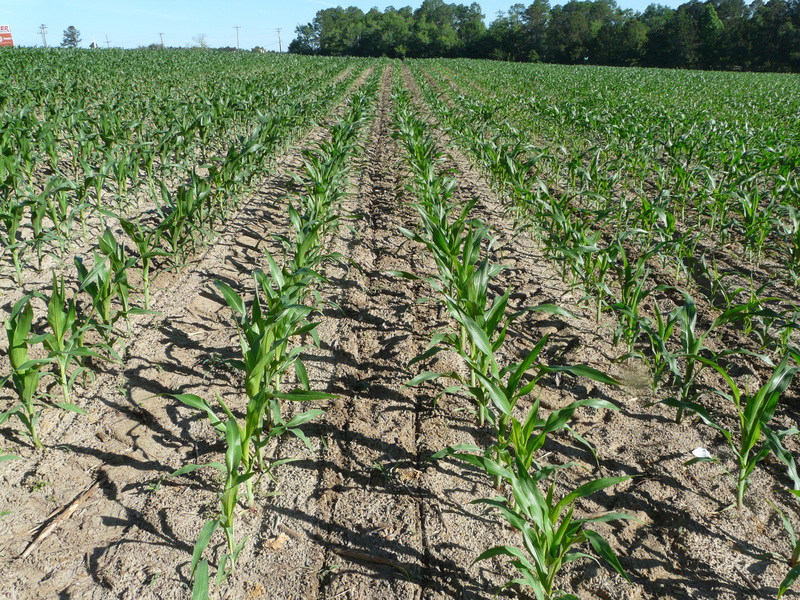 Check out the following pictures from my field corn plots that I rated earlier today. 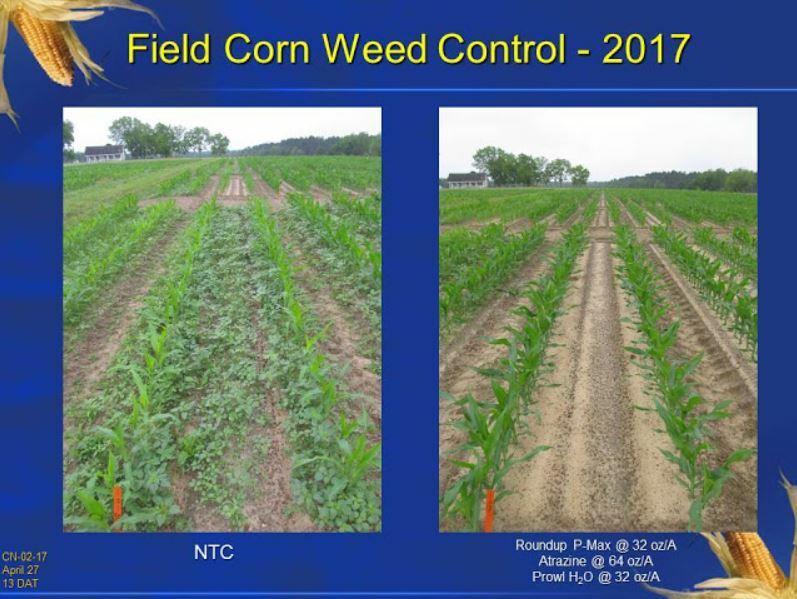 These herbicide treatments were applied 17 days after planting with a CO2-powered backpack sprayer calibrated to deliver 15 GPA at 3.5 MPH using AIXR 11002 nozzles. The most troublesome weed in Georgia field corn, in my opinion, is annual morningglory. 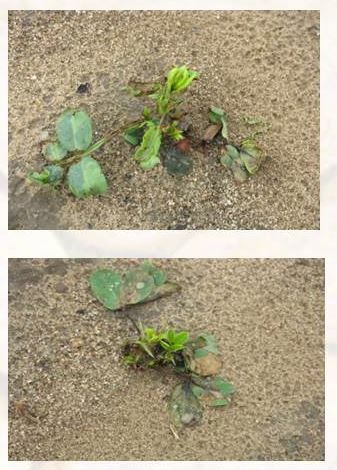 Field corn growers who struggle with morningglory should seriously consider a post-directed/lay-by application of Evik (ametryn) sometime after their initial POST treatment was applied. (Check out page 70 of the 2017 UGA Pest Control Handbook for more information about Evik.) 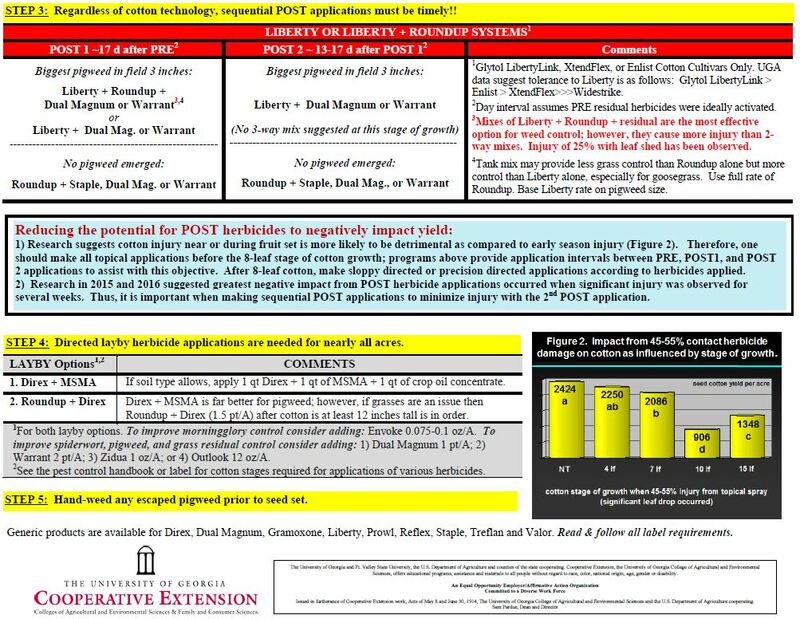 The minimum corn height for post-directed applications of Evik is 12″. 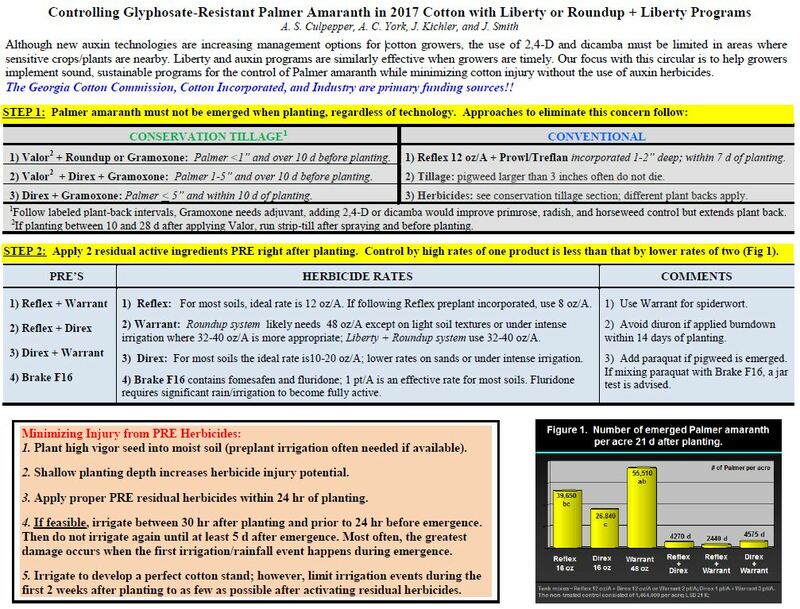 If Evik is tank-mixed with glyphosate, post-directed applications can be applied up until 48″ tall corn (RR2 hybrids). There is no need at this point to protect against rust. Some growers might put out a fungicide application as early as the V6-V8 stage to protect against leaf blights. Before doing so (unless the grower simply feels better doing the application anyway) scout for detection of the easily diagnosed lesions of northern corn leaf blight. Simply finding one or two scattered in the field is NO BIG DEAL. Finding the disease more widely scattered, on a susceptible variety, could be. DO NOT MIX AN ADJUVANT OR CROP OIL with fungicide applications made prior to tassel. This can result in significant ear deformation. 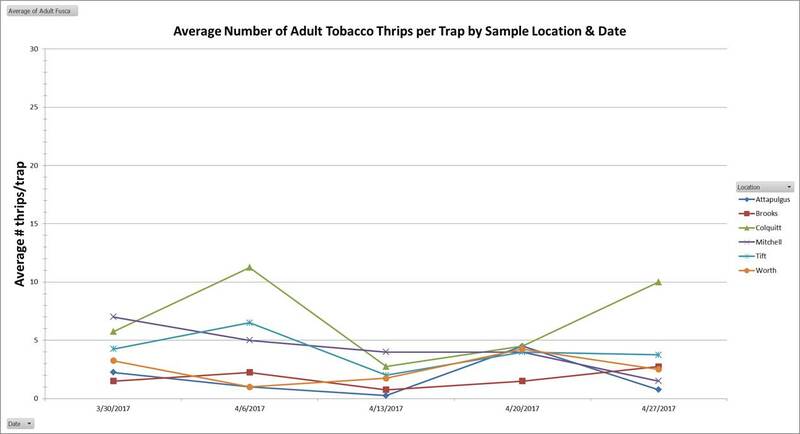 Thrips numbers on our traps have remained relatively steady for the last 3 weeks, though we did see a spike last week in Colquitt County. My first thrips trials are just now emerging from the ground, and I have not heard any reports of thrips control problems on early planted peanut as of today. I have had questions this week about rates of imidacloprid for in-furrow applications. 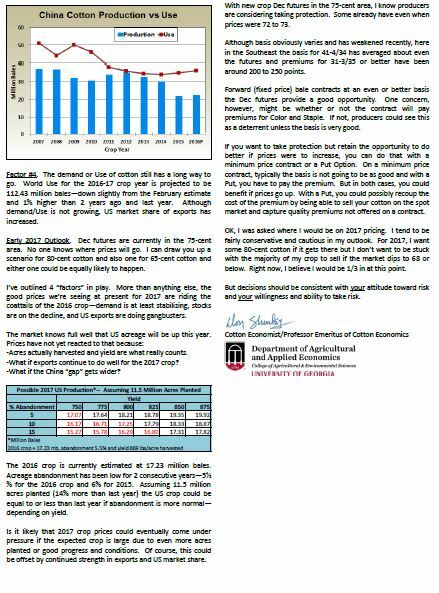 I recommend the upper end of the rate range for whichever formulation a grower is using….We should NOT be doubling the rate or cutting the rate in half. 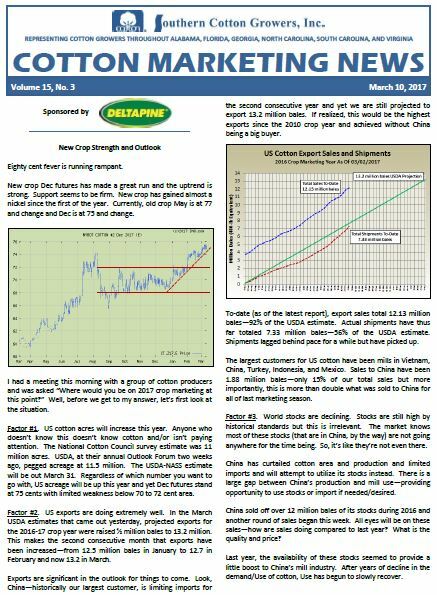 Be sure to check the label of the product you are using as rates vary by formulation. We may not have as much Valor as preemerge out there since we are dry and concern of no activation. Where we have Valor on the ground with good activation (0.5 – 0.75″ within 7 days), it usually gets us through our “at cracking ” treatments until we use Cadre. 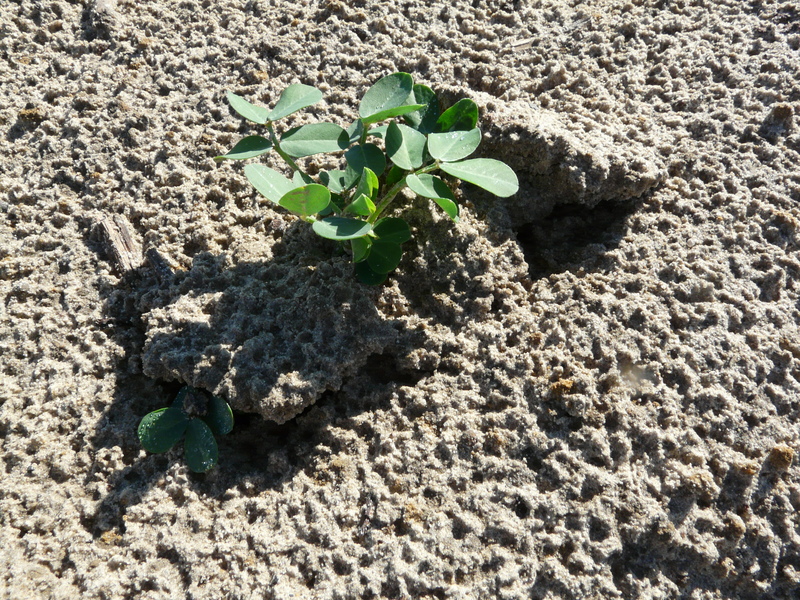 If we don’t have Valor, we will need to be gearing up for our cracking spray 15 – 25 days after planting. But we only need to apply ‘cracking’ sprays if weeds have come up. The only note to make is this week’s rainfall this week could help to cool soils, at least in the short term, and reduce risk to Aspergillus crown rot of peanut.